NetEnt’s games often feature a quirky, sometimes comical, but incredibly detailed cartoon style, which gives their games an absorbing narrative, increasing the player’s feeling of investment in their world. We’ve come to expect an immaculate level of quality from this team, and Starburst certainly doesn’t disappoint. Though it isn’t opened by an animated cut-scene, the beauty of this game is in its classic simplicity, and it seems right that the player is launched straight into the action. It has all other the hallmarks of a NetEnt offering, including stunning visuals, user-friendly controls and captivating bonus features. As with many NetEnt games, we open with a short, animated intro, introducing us to our friend Gonzo, a bearded fellow in a conquistador’s outfit, complete with metal helmet, as he jumps ship in the middle of the night to strike out on his own in search of the lost city. We follow him to the game screen deep in the jungles of Peru. 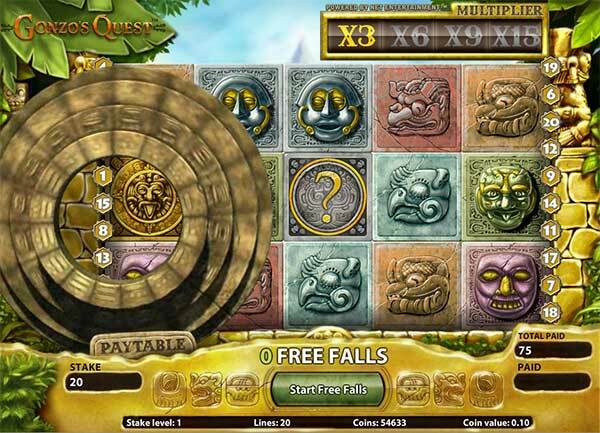 The background consists of jungle foliage and the relics of ruined Incan temples, and as the reels spin, we get a glimpse of an Incan pyramid behind them, adding to the realism of the game environment. Jungle birds sing quietly in the background, and there’s an immersive sense of being alone (bar Gonzo) in the jungle. Gonzo stands to the left of the five reels, keeping us company and occasionally consulting his map, as we spin. This is a great device, as his reactions motivate continued gameplay. For example, he will sometimes react to large wins with a celebratory anachronistic moonwalk across the front of the reels or a fist pump. Once in a while, he will even take off his hat, flip it in the air and spin it upside down on his finger, and it feels like a real achievement when you get him to do this while playing Gonzo's Quest! MULTIPLIERS – this standout feature cleverly uses the concept of avalanches, as mentioned above, to effect multipliers. The more avalanches, the more multipliers accumulate, with the initial avalanche creating a 3x Freefalls multiplier, a second creating a 6x multiplier, the third avalanche a 9x multiplier, and 4 or more avalanches a whopping 15x Freefall multiplier. The handy ‘paytable’ button at the bottom of the screen keeps you clued up on all the gonzo's Quest mechanics, bonuses, and the details of multipliers, which is great, as some of these operate in original and creative ways that might not seem obvious at first. You can quickly and easily set your bet level and coin value with shortcut buttons, and there is also an autoplay function if you’d like to take your hands off the rudder for a while. Also worthy of a mention are the spectacular sound effects. The sound of the stones tumbling as you spin the reels is remarkably real, and each spin (and some wins) are enhanced by the sound of pan flutes. This only adds to the completeness and consistency of the game world, and makes this game really shine in its quality. The Search for Eldorado is one of NetEnt’s most impressive productions. It’s quirky and absorbing, with seemingly-infinite little secrets and treasures to uncover along your journey of play. Gonzo’s presence and characterisation mean this game is brimming with personality and entertainment value. 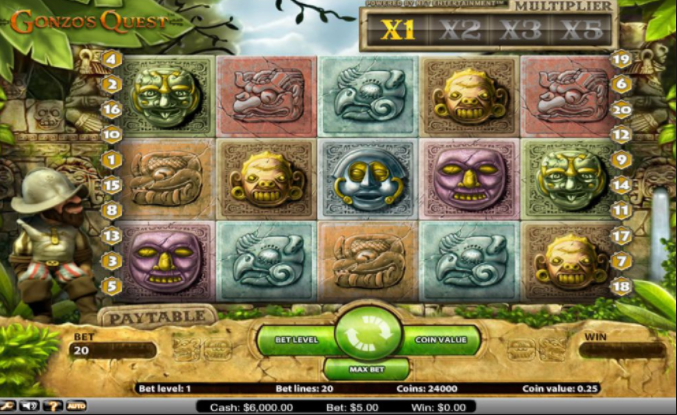 So often slots games focus on cash rewards, and this is, of course, a large component of this slot, but the game stands out amongst others because cash wins are accompanied by small, tantalising snatches of entertainment, that glint like jewels in an archaeological dig as the game progresses. El Dorado might be nothing more than a legend, but Gonzo’s Quest is definitely legendary. If you enjoyed then you might also like Planet of the Apes.